Perfect for decorating, gifts, wine charms, ornaments, and jewelry. Snowflake measures 1". 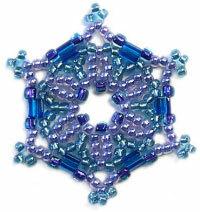 Beautiful in color too, Sandra ha stitched the same snowflake in 3 different colors to illustrate how versatile the design can be!